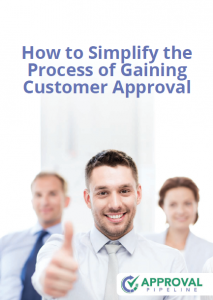 Do you get frustrated with the time and effort taken getting customers to approve proofs? The Approval Pipeline™ proofing system enables print companies to simplify the process of gaining customer approval for proofs and design work. Printers that use the system love it because it has brought order to chaos and, most importantly, their clients love using it too! It becomes a struggle to control all the emails flying around between large clients with complex approval processes and printers. The risk is that printers end up making costly mistakes, which upsets their clients and of course, their clients end up blaming them. Approval Pipeline™ is designed specifically for printers with large clients and complex approval processes. It streamlines and tracks the workflow so that they avoid costly mistakes and keep their clients happy. With Approval Pipeline™, sorting through email chains and keeping track of feedback from multiple reviews becomes a thing of the past. Third party management – You can seamlessly manage the proofing of work done by third party printers or designers. Version control – Approval Pipeline retains all of the previous versions of a proof so that you can go back to a previous version if necessary.